Linda Kohanov is beloved for her groundbreaking articulation of “the way of the horse,” an experiential wisdom known to riders for centuries but little studied or adapted to off-horse use. Now Kohanov takes those horse-inspired insights on the nonverbal elements of exceptional communication and leadership into the realms of our workplaces and relationships. Here we explore the benefits of “nonpredatory power” in developing assertiveness, fostering creativity, dealing with conflict, and heightening mind-body awareness. In “A Brief History of Power,” the first part of this far-reaching book, Kohanov profiles cultural innovators who employed extraordinary nonverbal leadership skills to change history, usually on horseback: Winston Churchill, George Washington, Alexander the Great, and Siddhartha Gautama (the Buddha), among others. She also draws on the behavior of mature horse herds, as well as the herding cultures of Africa and Mongolia, to debunk theories of dominance hierarchies, challenge ingrained notions of “survival of the fittest,” and demonstrate the power of a consensual leadership in which governing roles are fluid. Kohanov then adapts these lessons into twelve powerful guiding principles we can all incorporate into our work and personal lives. Eloquent and provocative, this is horse sense for everyone who seeks to thrive in the herds we all run in — our communities, careers, families, and friendships. Watch a fascinating 13 minute interview with Linda here! 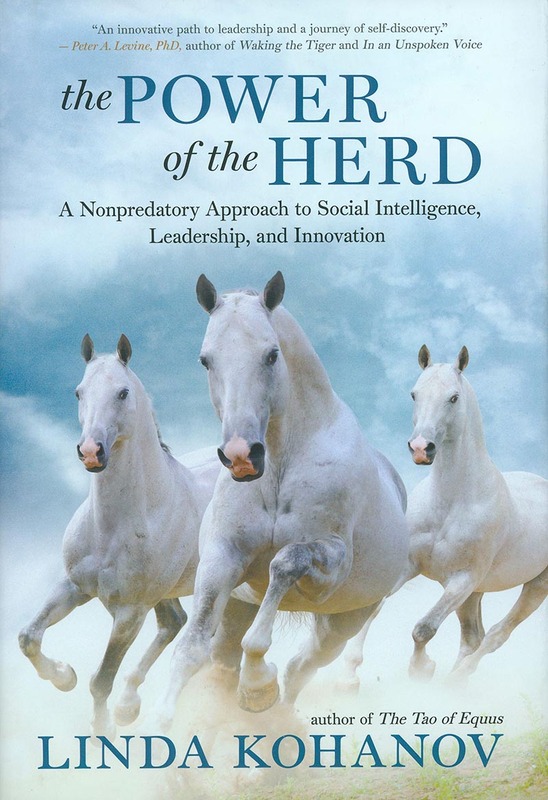 Linda Kohanov’s new book, The Power of the Herd explores the history of nonpredatory power, and offers practical skills for cultivating this emotionally and socially intelligent form of leadership. Over a hundred years ago, a budding naturalist noticed that mutual aid was a significant factor in determining fitness for survival. Pyotr Alekseevich Kropotkin, an early fan of Darwin’s theories, led research expeditions through Siberia and Eurasia, planning to add his own observations to the scientific literature on evolution. But soon enough, he was confused and, initially at least, sorely disappointed. “I failed to find — although I was eagerly looking for it — that bitter struggle for the means of existence, among animals belonging to the same species, which was considered by most Darwinists (though not always Darwin himself) as the dominant characteristic of the struggle for life, and the main factor of evolution,” Kropotkin wrote in his 1902 book Mutual Aid: A Factor of Evolution. Mutual aid, he insisted, was significant on both sides of that classic drama. But the sheer numbers of non-predatory species living peacefully with each other was even more of a revelation to the Russian prince. An over-simplification of Darwin’s “survival of the fittest” concept is still used to justify predatory business practices and political movements. Yet long before I encountered Kropotkin’s writings, my own horses challenged widespread notions that prey animals were quivering victims living at the mercy of powerful predators. My stallion Merlin, who would let squirrels share his grain, dealt harshly with aggressive dogs wandering into his space, sometimes grabbing a stunned canine by the neck and tossing it toward the gate. His otherwise gentle mare Rasa would cheerfully, playfully chase coyotes out of their pasture. These and other incidents caused me to update my perceptions---and my language---regarding the relationship between predator and prey. I began to study the benefits of non-predatory power, realizing that my staff and clients no longer had to associate strength, bravery, and protection with carnivorous metaphors. A particularly dramatic YouTube video, “Battle at Kruger,” offers a potent illustration, capturing an altercation between lions and water buffalo. The action starts with a bull, a cow, and their calf walking toward a large watering hole. Several massive cats suddenly leap out of hiding and race toward the calf, pulling her down with such momentum that she skids down a small hill and plunges into the pond. There a crocodile tries to steal this convenient meal away. Working together, several water-logged lions drag the unfortunate bovine back to shore. Yet just as they’re about to take that fatal bite, her parents return---with reinforcements---namely an angry mob of close to fifty buffalo. One nervy bull leaps forward and scoops a lion up with his horns, tossing her six feet in the air. The rest of the herd gains leverage as a result, scattering lions in all directions, surrounding the now standing calf. This video documents sophisticated nonverbal coordination between herbivores, with concern for a single youngster motivating the kind of altruistic courage we would call “heroic” in humans. Clearly, adult herd animals are not the dim-witted, cowardly weaklings they’ve been made out to be by human philosophers and scientists who over-identify with their own predatory tendencies. Natural herd behavior illustrates that power does not have to harsh, exploitive, oppressive, or short-sighted when we temper ambition with well-timed acts of mutual aid and competition avoidance. In this respect, it’s important to remember that human beings are not carnivores. We are omnivores with characteristics of both predator and prey. The idea is as old as the Bible. Predictions that “the lion shall lie down beside the lamb in paradise” point to a balanced human psyche in which the predatory aspect harmonizes with a gentler form of wisdom. In today’s highly competitive business environment, however, we need to take this metaphor one step further, cultivating the skills associated with mature, fully empowered, nonpredatory animals. In this respect, one herbivore stands out from all the rest. From an evolutionary perspective, the horse is an astonishing enigma, a prey animal willing to endure the horrors of war and the uncertainty of the unknown, carrying riders around the world for reasons that still boggle the mind, sometimes receiving medals for exceptional bravery along the way. History clearly shows that humans were also transformed by this interspecies relationship. Many innovative leaders exercised courage, charisma, poise, endurance, and conviction through lifelong associations with silent, nonpredatory tutors. Alexander the Great, the Buddha, Genghis Khan, Joan of Arc, George Washington, Katherine the Great, Geronimo, Winston Churchill, and Ronald Reagan were accomplished equestrians who had close relationships with spirited, arguably heroic horses. Their mounts were not mindless machines. They required---and fostered---an almost supernatural level of leadership presence capable of motivating others to face outrageous odds and create innovative, highly ambitious empires. At the same time, training and caring for horses demanded an understanding of how to tap resources without taxing them. In the process, some leaders adopted, then adapted, nonpredatory behavior to deal more effectively with human beings. George Washington is the most notable example. His ability to stand up to a much larger, better trained, exceedingly well-funded, intensely predatory British army rested on a physically and emotionally heroic form of nonpredatory power. “Let your heart feel for the affliction, and distress of everyone,” he advised. In Washington’s courageous presence, people were able to endure incredible hardships because they knew he cared. Insulated from nature, modern civilization treats people more like machines than sentient beings while overemphasizing predatory power. For this reason, creative, empathetic innovators are sometimes reluctant to step into leadership roles. Yet our troubled institutions need strong, compassionate leaders now more than ever. Learning to recognize and cultivate nonpredatory power is essential to regaining balance. The predatory side of human nature is especially useful in culling those business practices, behaviors, and beliefs that need to die a quick, humane death so that everyone can survive the winter---and thrive during the spring, summer, and fall---allowing us to curtail rabid conquest and growth in favor of a co-creative, mutually beneficial balance with nature and “neighboring tribes.” Other activities---such as setting strong boundaries with aggressive herd members, leading, and negotiating with, even fighting, predators---can be achieved through non-predatory approaches to power. Based on the book The Power of the Herd. Copyright © 2013 by Linda Kohanov.